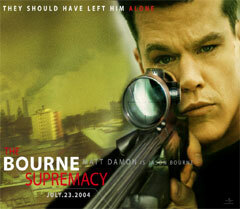 “The Bourne identity” took me by surprise; it was certainly a most welcome surprise. “The Bourne identity” and “The Bourne Supremacy” are two different movies, and the Jason Bourne from both movies are different people. Now here, he’s no longer a man discovering his past, now he’s just a man struggling with it and the severity of his crimes and deeds he performed as Jason Bourne, he’s a ghost of the past struggling with his unforgiving demons of his past, and he’s a ghost who can not escape them no matter how hard he tries. Damon returns this time around as Bourne, and he’s an actor who surprised a lot of people (me, included) by proving himself an action star as Bourne, the humble but oh so lethal anti-hero who will stop at nothing to protect himself and the people he cares for. There’s a lot to like here including the cast. One of my favorite underrated actors Brian Cox returns to an even bigger role this time around as agent Ward Abbot, and this time instead of Chris Cooper, we now have great actress Joan Allen who plays Pamela Landy, a woman who is more than determined to capture Bourne and willing to capture him at all costs. See? You trade one excellent actor (Cooper) for another (Allen), what more could you ask for in a sequel? Allen pulls in her usual great performance here, and is a truly formidable foe to be reckoned with, she’s also just as watch able as Cooper was, except this time around she’s blind to what is happening and is willing to discover why he’s suddenly entered the scene. With a stellar cast, there’s also the new objective of Bourne after a surprise twist at the beginning of the movie, and now it’s personal for him as we watch the old Bourne return to rare form to take names and lives if possible. Damon is great yet again here, and has a different feel to his personality; Bourne’s sheer resourcefulness is a lot of fun to watch here, and it’s safe to say Bourne is a lot different in this round, and Damon plays to that cause very well as he usually does and approaches this dark murky sequel with a lot of gusto. There’s more of a sense of desperation within his character and we feel it and want to know how he comes to grips with it. This time around someone has framed Jason Bourne killing two operatives and stealing some important documents, and Bourne’s life is disrupted; a surprise and unwelcome twist in the beginning leads to new motivation for the character of Bourne and now, he means business, and now he stands by the threat he gave in the climax of the original film (Excellent scene, by the way), and is taking no prisoners. This is the usual great espionage fare with some truly good car and foot chases, especially the one in the train station, and it’s mostly fueled by the top-notch acting we have here. I enjoyed Doug Liman’s direction in the first film and director Paul Greengrass has a mood all his own, as he directs a darker more indie-feeling sequel (apart from the glossed atmosphere from the original film) and does a competent job here. There’s a lot of handheld camera shots for realism and increase of tension amidst the moments. It’s a somewhat welcome change despite Doug Liman’s very good direction in the original, some of the shots tension and suspense are increased two-fold. All the while, this franchise has a lot of places to go with the buffed up soundtrack, excellent performances, and of course Damon who is just great here. Bravo. It’s so nice to see an action film driven by the acting and not the special effects. That’s a rarity, wouldn’t you agree? Director Paul Greengrass pulls off something here, he makes his form of directing a lot different from original director Doug Liman’s, but that’s not necessarily a good thing. The direction many times can be very shaky and pretty bad with many of the most important scenes in the movie including Bourne’s confrontation with the only remaining agent of Treadstone. I was very disappointed with that scene because not only was it potentially one of the best scenes in the movie but the camera shook erratically so that I couldn’t tell what the hell was going on. Greengrass goes for the artsy handheld effect here which worked for tension in certain sequences, but was most unwelcome in many others which really ruined the experience that I wanted. It’s a very good follow-up even if not as good as the original, and the direction is pretty awful at times. However, this is a very good sequel with some great performances, great action, and a story that is a lot darker and more involving. This entry was posted in Movie Reviews and tagged Action, Adaptation, Adventure, B, Crime, Sequel, Spy, Thriller. Bookmark the permalink.